Terri Lynn Ford, 50, of Sedalia, MO, passed away Wednesday, October 10, 2018 at University Hospital, Columbia, MO. She was born on December 31, 1967 in Kansas City, MO, the daughter of Frances Eugene and Pauline Mae (Clark) Ford, who preceded her in death. Terri attended grade school in California, MO, Jamestown, MO, and Boonville, MO. She graduated high school at Sacred Heart Catholic School in Sedalia, MO. She served her country honorably in the United States Army from 1992 to 1996. She worked as a general laborer of Fantasia, Duke, and Waterloo. She also worked for Hardee’s and Bothwell Hospital for several years. She liked fishing and long walks hunting mushrooms. She loved flowers and went to college for landscaping. She also loved carousel horses. Survivors include, four brothers, Steve Ford (Rose), Charles Ford, George Ford, and Paul Ford (Penny); a sister, Ozembia Maddex, all of Sedalia; her life partner and best friend of twenty years, Kim Reese of Sedalia; and several nieces and nephews. 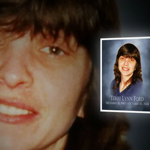 In addition to her parents she was preceded in death by a brother, Dennis Ray Ford; and a sister, Ina Ruth Ford. Funeral services will be held at 10:00 a.m. Wednesday, October 17, 2018 at Rea Funeral Chapel with Rev. Dan Hankings officiating. The family will receive friends from 6:00 p.m. until 8:00 p.m. Tuesday, October 16, 2018 at the Chapel. Burial will be at Crown Hill Cemetery, Sedalia, with full military honors conducted by the VFW Post #2591 and the United States Army National Guard. Pallbearers will be Danny Dotson, Terrence Cline, James Hedrick, David Dotson, Chris Mizanskey, and Jeff Mizanskey. Honorary bearers will be Tom Ford, Chasity Ford, Sabrina Ford, Pauly Ford, Jr., Chandra Ford, Brad Ford, and Kellie Jessup. Memorial contributions may be made to the family in care of the funeral chapel. Terri was such a kind sweet soul. While I only kept up with her in recent years through Facebook, we were friends back in high school. She will be missed. My thoughts and prayers will be with those she has left behind. Prayers to ease your pain at this time. May peace be with you. My heartfelt sympathies for Kim and Terri’s family. Terri will be missed by me, I know.